The winner of the Learning Opportunities award is SI Cirencester and District for the Literacy Competition. 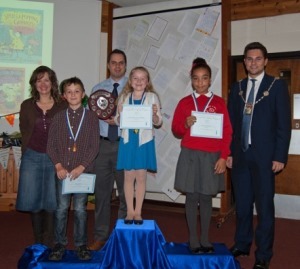 SI Cirencester and District formulated the Literacy Competition, now in its 6th year. The aim is to improve literacy in local schools, and in 2015 fifteen local schools took part, which is more than previously. S I Cirencester achieved a major triumph when the Literacy Competition it organises was named the overall winner of the Learning Opportunities award, at the Soroptimist International of Great Britain & Ireland annual Federation conference, held recently in Glasgow. Teachers, parents, carers and the school governing bodies have all remarked on the success of the project, which has gone from strength to strength and raised the profile of Soroptimism locally and associated the name with Education. It is hoped that even more schools will take part in 2016.